Trani is a splendid inhabited centre facing the Adriatic Sea, in the province of Bari, attracting visitors by the beauty of its port and an immense historical architectonic patrimony. Its territory has been inhabited continuously since Neolithic times, but the present day centre appeared during the Roman Era by the name of Turenum along the route of Via Traiana, probably during the III Century AD. Instead, according to legend, it was founded by Tirreno, mythical son of the Homeric hero, Diomedes. After the end of the Roman Empire (476), Trani became part of the Ostrogoth Reign (496-535), only to return to the Eastern Roman Empire after the Greek-Gothic War (535-553). It remained under the Byzantines for a century until it was conquered by the Longobards of Northern Puglia. After the year 813, Trani became an Episcopal Seat following the destruction of Canosa by the Saracens. In ‘881, it returned as Eastern Empire property, against which, however, there were popular uprisings during 1010 and 1018. From this period come the famous maritime Ordinamenta Maris, which for the first time, encoded commercial seamanship. The Castle was constructed under the Swabians, in front of the sea where Manfredi lived for many years and the port began to gain fundamental importance along the Eastern route, as testified by continuous clashes between the Swabians and Venice. During ‘200, under the wishes of the Swabian Emperor, the City became a civil and penal judiciary seat, gaining further prestige and wealth. The arrival of the Angioini (1269) coincided for Trani with the beginning of a period of decadence, which only ended with the advent of the Aragonese (1442) to the throne of Naples. 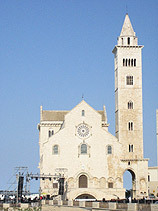 Trani was ruled by Venice between 1496 and 1509 and enjoyed new splendour with the return of the Spanish. In 1799, some of the population participated in the revolutionary motions, but in the City the faction united with the Pope prevailed and for this reason, Trani was besieged by French troops under General Broussier. With the rise of power of Naples and the Mezzogiorno of Bonaparte (1806), Trani was excluded from the most important administrative seats, leading to economic decline. This was only interrupted in 1816, through regained Bourbon power. The City returned as seat of judiciary processes, a role once again removed in 1923, causing new economic decline. Today Trani is a tourist meta for excellence in Puglia and for the beauty of its monuments and port. 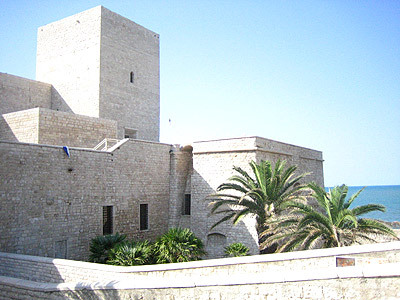 A visit to Trani and its magnificent historical centre made of Trani stones and buildings, churches, a visit to the port to admire the Federick II Castle which dominates the sea, is an unforgettable experience for any visitor sensitive to artistic beauty. The Romanesque Cathedral, dedicated to San Nicola Pelligrino (1097), a magnificent building in front of the sea, became a reference point for navigators; the Ognissanti (All Saints) Church built by the Templar Knights during the XIII Century; the Monastery and Colonna Church, the San Francesco Church and the San Giacomo Church complete the Romanesque visit to the City. The visit can not end unless it includes Palazzo dei Dogi of Venice and the Synagogue of Giudecca; once a ghetto and refuge for Jews.